An excellent evening, lovely area, courses and weather! Lots of fun had on the easy course by the Torphins Brownies – well done all of you. 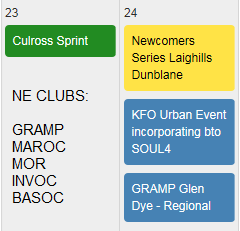 The five weeks of Summer Series events so far should have you all psyched up for this weekend’s orienteering: Saturday at Westhill and Sunday at Glen Fearder. And don’t forget next Wednesday is BBQ* time at Balmedie – the final event of the Grampian Adventure Challenge – will it be Maersk Oil claiming the bonzai again? *BBQ coals supplied but bring your own food!